Increased workload or pressure, such as deadlines or specific projects. Don’t let any unauthorized people into the facility. Alert security about strangers or anyone else, such as a former employee, who should not be in the workplace. Do not confront these people yourself! Tell your supervisor about any people you do not want to see at work. Tell your supervisor if you are dealing with domestic violence. Be familiar with all facility exits and note the one you would use if need be when you move around the facility. Know your security guards and how to contact them if the need arises. Let someone know if you are working overtime. Try not to work alone. Don’t leave your workplace alone, if at all possible. Doing anything to avoid going somewhere with the violent person. Tip 4. Report it. It is critical that all your workers take any work-related violence or threatening behavior seriously. They must report these incidents immediately before situations can get out of hand. In order for them to feel comfortable reporting a violent, or potentially violent incident, you must have a policy and procedures in place that are convenient for your workers and protect them from any possible retaliation. 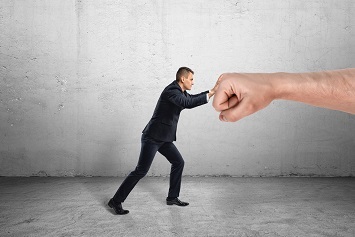 Your policy should include that retaliation against a worker who makes a good-faith report of violence or other disruptive behavior is strictly prohibited and subject to appropriate corrective or disciplinary measures. In addition, workers should feel comfortable reporting violence or intimidating behavior to managers or supervisors other than his or her own in cases where the behavior is by his or her own supervisor.